This article is about the graphical user interface in operating systems. For software technology that separates the desktop environment and associated application software from the physical client device that is used to access it, see Desktop virtualization. For the virtual reality software application, see Virtual Desktop. 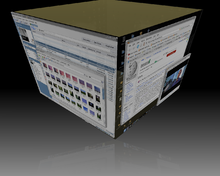 Virtual desktops rendered as the faces of a cube. In this example a Unix-like operating system is using the X windowing system and the Compiz cube plugin to decorate the KDE desktop environment. In computing, a virtual desktop is a term used with respect to user interfaces, usually within the WIMP paradigm, to describe ways in which the virtual space of a computer's desktop environment is expanded beyond the physical limits of the screen's display area through the use of software. This compensates for a limited desktop area and can also be helpful in reducing clutter. There are two major approaches to expanding the virtual area of the screen. Switchable virtual desktops allow the user to make virtual copies of their desktop view-port and switch between them, with open windows existing on single virtual desktops. Another approach is to expand the size of a single virtual screen beyond the size of the physical viewing device. Typically, scrolling/panning a subsection of the virtual desktop into view is used to navigate an oversized virtual desktop. Switchable desktops were designed and implemented at Xerox PARC as "Rooms" by Austin Henderson and Stuart Card in 1986 and (unknowingly to the authors until their publication) was conceptually similar to earlier work by Patrick Peter Chan in 1984. This work was covered by a US patent. Switchable desktops were introduced to a much larger audience by Tom LaStrange in swm (the Solbourne Window Manager, for the X Window System) in 1989. ("Virtual Desktop" was originally a trademark of Solbourne Computer.) Rather than simply being placed at an x, y position on the computer's display, windows of running applications are then placed at x, y positions on a given virtual desktop “context”. They are then only accessible to the user if that particular context is enabled. A switching desktop provides a pager for the user to switch between "contexts", or pages of screen space, only one of which can be displayed on the computer's display at any given time. Several X window managers provide switching desktops. Other kinds of virtual desktop environments do not offer discrete virtual screens, but instead make it possible to pan around a desktop that is larger than the available hardware is capable of displaying. This facility is sometimes referred to as panning, scrolling desktops or view-port. For example, if a graphics card has a maximum resolution that is higher than the monitor's display resolution, the virtual desktop manager may allow windows to be placed "off the edge" of the screen. The user can then scroll to them by moving the mouse pointer to the edge of the display. The visible part of the larger virtual screen is called a viewport. Virtual desktop managers are available for most graphical user interface operating systems and offer various features, such as placing different wallpapers for each virtual desktop and use of hotkeys or other convenient methods to allow the user to switch amongst the different screens. The first platform to implement multiple desktop display as a hardware feature was Amiga 1000, released in 1985. All Amigas supported multiple in-memory screens displayed concurrently via the use of the graphics co-processor, AKA the "Copper". The Copper was a simple processor that could wait for a screen position and write to hardware registers. Using the GUI implemented in system ROM API's, programs could transparently display multiple independent screens, from non-consecutive memory, without moving the memory. This hardware-based scrolling does not use blitting, but something more like what is sometimes called hardware panning. The video output is simply told (once, or many times) where to display (scanline) and from what screen memory address. A screen can move to any position, or display any portion, by modifying the wait, or fetch position. Typically a single byte value. The Copperlist did need to be sorted in vertical and horizontal wait position in order to function. Note: See http://www.faqs.org/faqs/amiga/books/ for a list of reference material. Each desktop or 'screen' could have its own colour depth (number of available colours) and resolution, including use of interlacing. The display chipset ('graphics card' on a PC) could switch between these desktop modes on the fly, and during the drawing of a single screen, usually with three pixel deep line between each desktop shown on the screen. However, if one interlaced (flickering) desktop was displayed, all desktops onscreen would be similarly affected. This also allowed the OS to seamlessly mix "Full Screen" and Windowed "desktop"-style applications in a single environment. Some programs, VWorlds (an astronomy simulator) being an example, used the multiple desktops feature to overlay a set of controls over the main display screen. The controls could then be dragged up and down in order to show more or less of the main display. Dynamic virtual desktops in GNOME Shell. Workspaces are automatically added or deleted as the existing ones are respectively consumed or freed. Almost all Unix and Unix-like systems use the X Window System to provide their windowing environment. The X Window System is unique in that the decoration, placement, and management of windows are handled by a separate, replaceable program known as a window manager. This separation allowed third-party developers to introduce a host of different window manager features, resulting in the early development of virtual desktop capabilities in X. The first implementation of virtual desktops for Unix was vtwm in 1990. Many of today's X window managers now include virtual desktop capabilities. Configurations range from as few as two virtual desktops to several hundred. The most popular desktop environments, GNOME and KDE, use multiple virtual desktops (two or four by default) called workspaces. Some window managers, like FVWM, offer separate "desks" that allow the user to organize applications even further. For example, a user may have separate desks labeled "Work" and "Home", with the same programs running on both desks, but fulfilling different functions. Some window managers such as dwm and Sawfish support "tagging" where applications can be configured to always launch on a particular desktop, supporting automatic organization and consistent navigation. Until Windows 10, Microsoft Windows did not implement virtual desktops natively in a user-accessible way. There are objects in the architecture of Windows known as "desktop objects" that are used to implement separate screens for logon and the secure desktop sequence (Ctrl+Alt+Delete). There is no native and easy way for users to create their own desktops or populate them with programs. However, there are many third-party (e. g. VirtuaWin, Dexpot and others) and some partially supported Microsoft products that implement virtual desktops to varying degrees of completeness. Microsoft offers a utility called Desktops which allows users running Windows Vista or Windows Server 2008 or later operating systems to run applications on up to 4 virtual desktops. Unlike nearly all other virtual desktop solutions for Windows, this utility actually uses native "desktop objects," as discussed above. Because of this, it does not offer the ability to move programs between desktops, or in fact to stop using virtual desktops at all, short of logging off, and Windows Aero only works on the primary desktop object. Microsoft had previously provided a Virtual Desktop PowerToy for Windows XP, which simulates many desktops with the more common method of hiding and showing windows in groups, each group being a different desktop. However, the functionality provided is less comprehensive than that of many other virtual desktop solutions (e. g. maintain a window in a given desktop even when its application bar button flashes, etc.). As with all virtual desktop utilities that work by hiding and showing windows, application compatibility problems are common, because application developers do not expect virtual desktops to be in use on the Windows platform. Historically, software packaged with some video card drivers provided virtual desktop functionality, such as in Nvidia's nView product (this product has been discontinued for GeForce card owners since Vista). Some of these programs provide eye-candy features similar to those available on Compiz. Many desktop shell replacements for Windows, including LiteStep, bblean, GeoShell, SharpE, Emerge Desktop and others, also support virtual desktops via optional modules. Windows 10 offers virtual desktops through a system known as "Task View". Despite its Unix underpinnings, Mac OS X does not use X Windows for its GUI, and early versions had no provision for virtual desktops. Beginning with Mac OS X 10.5 Leopard in late 2007, Mac OS X has shipped with native virtual desktop support, called Spaces, which allows up to 16 virtual desktops. It allows the user to associate applications with a particular "Space". As of Mac OS X 10.7 Lion, this functionality has been moved into Mission Control. Spaces in Mac OS X "Leopard"
Scrolling desktops were made available to Macintosh users by a 3rd party extension called Stepping Out created by Wes Boyd (the future founder of Berkeley Systems) in 1986. The code for this extension was integrated by Apple into a later version of the Mac OS, although the ability to create virtual desktops larger than the screen was removed. The code was used instead as an assist for visually impaired users to zoom into portions of the desktop and view them as larger, more easily discerned images. BeOS includes an implementation of virtual desktops called "Workspaces". Up to 32 different Workspaces are supported. ^ Thomas E. LaStrange (1990) swm: An X window manager shell. USENIX Summer. ^ "Microsoft Unveils Windows 10 with New Start Menu". Tom's Guide. Retrieved 30 September 2014. ^ "Windows 10 is the official name for Microsoft's next version of Windows". The Verge. Retrieved 30 September 2014. Ars Technica: "The Micro-AmigaOne and Amiga OS4 Developer Prerelease" (Update 1), By Jeremy Reimer, Monday January 17, 2005 ("Desktop and drawers" section). This page was last edited on 3 April 2019, at 22:34 (UTC).